This new Airtel Data Plan offer is a real explanation of "Small Girls With Big God" because with small money, you enjoy big data bonuses when you subscribe to a data plan. 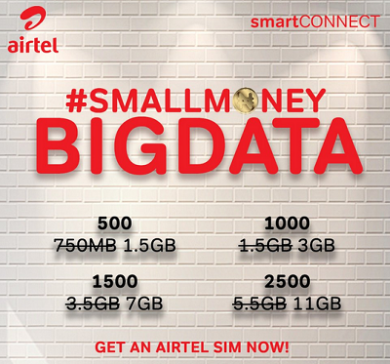 (if you know, you know) In other words, new and existing Airtel Customers can enjoy double data bonuses on this package tagged "small money big data plan" . A recharge of N500 gives you 1.5GB data, instead of the regular 750MB. A recharge of N1,000 gives you 3GB data, instead of 1.5GB. A recharge of N1,500 gives you 7GB data, instead of 3.5GB. A recharge of N2,500 gives you 11GB data, instead of 5.5GB. Buy a new airtel sim and by default it’s on smartConnect tariff, then recharge and dial *141#to subscribe your desired data plan and enjoy double data offer.